Why not head for the start line? If you are a new visitor to this blog why not start from the beginning with “From little acorns”. You can also follow Lee Crampton’s non-cycling musings here. So the plans went completely out of the window following a knee injury (rather scary to think that nearly two years have passed since then). I put it down to macho pride in trying to keep up on a steep climb too early on in the ride with two youngsters (9 and 20 years younger than me and one of them very bike fit). Reflecting on it the same problem has bothered me on a few occasions whilst fell walking but it usually self-corrected within a couple of days. The injury hasn’t resolved itself and I have a twin pain in the other other knee now, so along with the duff back (lower and upper) I’ve been feeling very sorry for myself in terms of achieving any cycling goals whatsoever. With the help of some hefty youngsters I’ve been barrowing stone, subsoil (for which read heavy wet clay full of stone) and topsoil; over 30 tonnes in all. My slice of the action is probably 20-25% of that, so I figured a bit of cycling would be a walk in the park (to deliberately mix my metaphors) and I got out the other night for a quick 10 mile spin. Living in the Cumbrian hills is a mixed blessing especially when you are unfit as the hills are somewhat steep and the winds often pretty forceful. On the A683 Sedbergh road (after only the first mile) I was faced with very strong headwinds. In my haste and not having been out on the bike since last August I forgot both my heart rate monitor and more importantly anything to drink. Live and learn Lee, live and learn. At least I was back in the saddle at last. The knees are the same (but working) and the back still hurts. 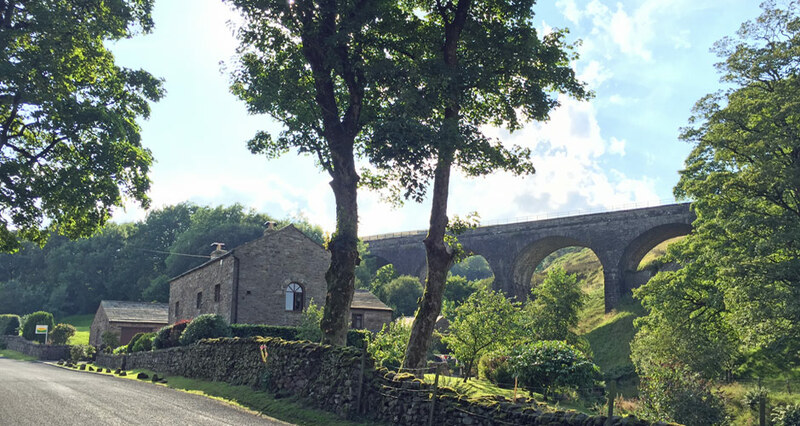 Ten miles was a sensible starter run (not sure I’d have got much further when you look at the climb back up to Hill View) so I now need some regular rides to build up the stamina with a summer goal to get the Coast To Coast (C2C) under my belt. Wish me luck and no further injuries. Don’t let on to my specialist physio that I have been somewhat lax with my exercises for the duff knee (thinking about it he’ll earn more in the long term). Anyway, the lack of exercise in general and more specifically the cycling has brought me up short having decided to get back on the bike again yesterday. It has been five weeks since I last had a spin and I see from my logbook that I managed a respectable twenty four miles (the knee held out) . Yesterday I leapt into action for a test run (knowing the knee was no better) and managed an eleven mile loop with some hefty winds on the open fells to grapple with. Today it looked too nice to ignore another opportunity to get mobile. It was only on the last climb that I realised a ten percent gradient after twenty miles and over fifteen hundred feet of climbing was about the limit of my current fitness. I had to get off the bike for the last twenty metres of the climb and it really cheesed me off that I did not have the legs to make it. On a positive note it is another thirty miles and more than enough exercise to burn off the cream tea and a few glasses of wine in the evening. That’s what I like to tell myself anyway (as I watch the Olympics on the TV). I died for 12 minutes! It’s official. Well that’s according to Garmin. Take a look around 1 hour 44 minutes when I had no heartbeat until 1 hour 58 minutes. Fortunately I lived to tell the tale. I was somewhat drowned in the heavy rain and my fitness levels have plummeted due to inactivity caused by the persistent knee injury. Hopefully the consultation with the physiotherapist on Tuesday will provide a pointer as to what exactly is wrong with my knee. My heart rate is way higher than it has been (10 ppm higher on average) and I peaked out at 196 bpm on the last climb home against a very heavy head wind . I guess it’s time to investigate some supplementary exercise focused on lowering the heart rate. So you are all wondering where I’ve been and what’s happening to my cycle training (ok so maybe you are not). The season started off well and ground to a fairly shattering halt with a knee injury. I was cycling with ‘the youngsters’ (8 and 10 years the younger) when the pain in my knee first hit at about 3 miles into a 25 mile loop. Being the typical (worse) kind of macho male I soldiered on (you see even the subconscious use of a military reference proves the point about being macho – no flaming regarding women in the military please). After stopping for a cuppa at Orton Scar cafe I already knew that I would be in agony on the way back and probably off the bike for two or three days. Here I am ten weeks on with the gammy knee. 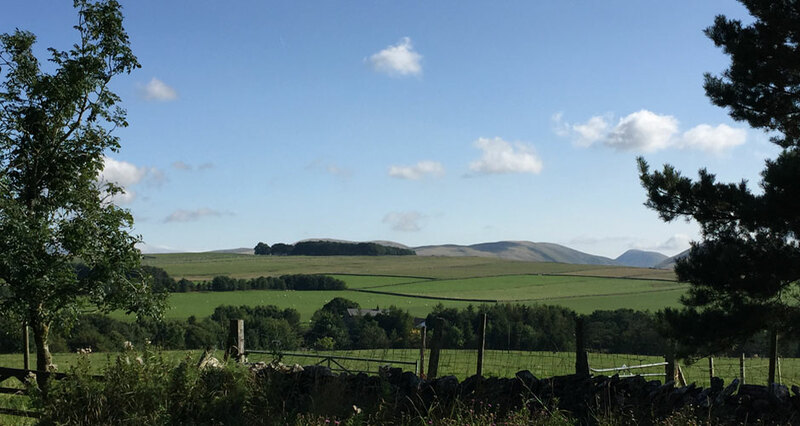 I have managed a couple of very minor trips with Lydia (as she is cycling for the first time after her partial knee replacement) and one loop to Sedbergh and back (22 miles) but I am already at my limit without causing further damage. My specialist physio consultation is three weeks away so the season is fast slipping away and I am very tetchy indeed. Wish me a speedy recovery otherwise the Land’s End to John O’Groats trip will have to be postponed ! Well somewhat after the event here’s what happened on the last rides of last season (and remember it was a short season due to my not getting a bike until August). Cav and Lance (that’s Kev & Lee to you) planned to bag two consecutive days of 50 miles per day. It doesn’t sound much but it is within the bounds of steady sensible training. Now bear in mind that it was October 31st when we set off. We represented the two extremes of inexperience, the boy racer (Cav) in his short sleeved shirt and bib shorts using my small hydro pack as his luggage (for the night out), with the old timer (Lance) replete with panniers and handle bar bag (already attired in multiple layers). My drinks, gels and drugs (all legal), toolkit, spare tubes, navigation kit, phones, music and video camera were safely clipped on or stashed and we were good to go. First stop one mile in. Well you’ve got to make some initial adjustments haven’t you. Cav pushed on as though we were in a road race. Not for speed as such but viewing any breaks I requested as wimping out. Lance senior saw tea and scones with butter jam and cream as essential fuel (who wants to consume frickin’ gels all the way?). The last hour was testing especially up “foggy hill” (that’s not the correct name – maybe it’s “fog hill” but it’s all a distant memory now). It was getting dark by the time we arrived in Skipton but all was well. The shower in the hotel and the pizza with beers were excellent. Sleep came all too soon. The return journey turned just over 50 miles into 62.5 as we did an unplanned ‘foggy hill’ loop (twice) before defecting to the A65 (a very big mistake for all you traffic haters). 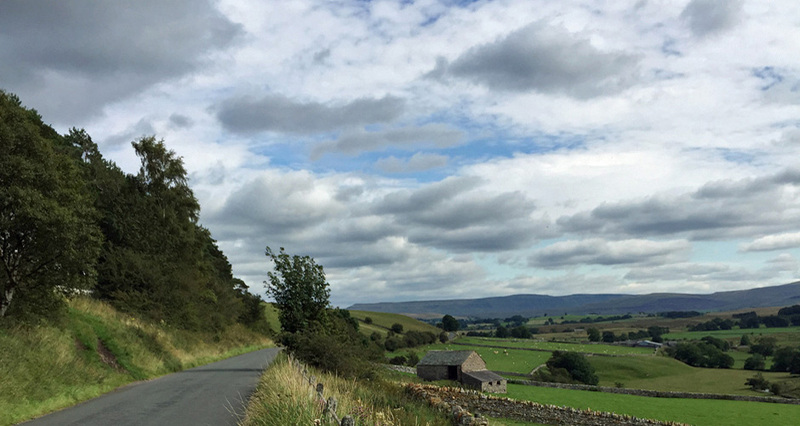 Once back in the Yorkshire Dales proper I was fooled again by the Garmin (well a chap has to learn to interpret these things rather than just following a pointy arrow you know) but we were essentially going the right way as it happens and were soon cruising close to Hawes. November 1st 2015 was the hottest November day since records began and it was like the best summer’s day you ever had. Truly stunning. Which was just as well for the boy Cav because if it had been a typical November day he would have frozen his saddle pack for sure. I wish I hadn’t discovered the faulty camera on my iPhone on this trip as we witnessed the most spectacular cloud inversion over a viaduct deep in a valley from the top of a steep descent. 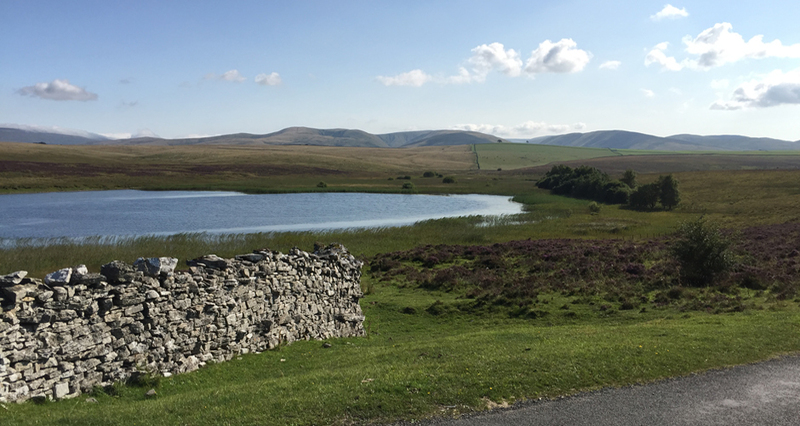 A cup of tea and ice cream at Dent gave me a false sense of energy because the last 12 miles from Sedbergh (pretty much all ascent) was painful in the nether regions and the legs. The last mile climb to Hill View was a struggle. It was one of the best weekends I’ve had and I look forward to many more like it. As the preparation for this coming weekend’s trip gets underway I’ve even taken to the first bike cleaning session. The beast looks good and the panniers are packed in order to see what the overall effect is like. There will be the range of liquids, gels, nutri-bars etc as well as a miniature bag under the saddle with tools, inner tube, repair kit, coins and notes. The bar bag well take care of all the essential items not already strapped to the bike or in the panniers, including a range of credit / debit cards, Dales Rail Card (in case of a disaster), minor clothing accessories and routes cards in case of a tech catastrophe. So it’s a proof of concept in a small way. 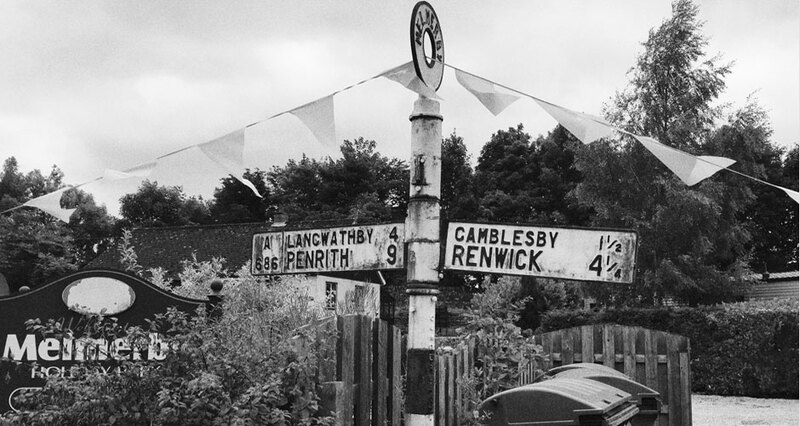 Fifty miles out and fifty miles back the next day with a fair amount of climbing along the way. Skipton has a really nice bike shop (hope it’s open on Sunday) and the town is lovely anyway. 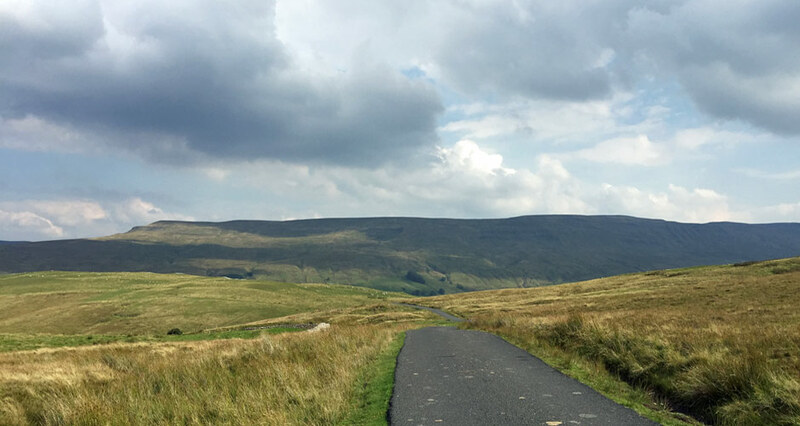 What with a halfway point at the delightful Hawes what could be nicer? Kev (aka Cav since he’s met him) and yours truly (aka Lance since I have been known to be “off road” with respect to the pharmaceuticals at various points in history) are putting the first pedal rotation in on Saturday morning at 9am. We only need to double the daily distance (90 – 100 miles per day) and repeat for the equivalent of six weekends concurrently (12 days consecutively) to equal the End to End journey. When is a hill not a hill? I was pondering where to take my break from work for my 50th bike ride (and more to the point getting to the 750 miles marker) and I settled upon a loop of about 15 miles but in reverse of a couple of previous rides. 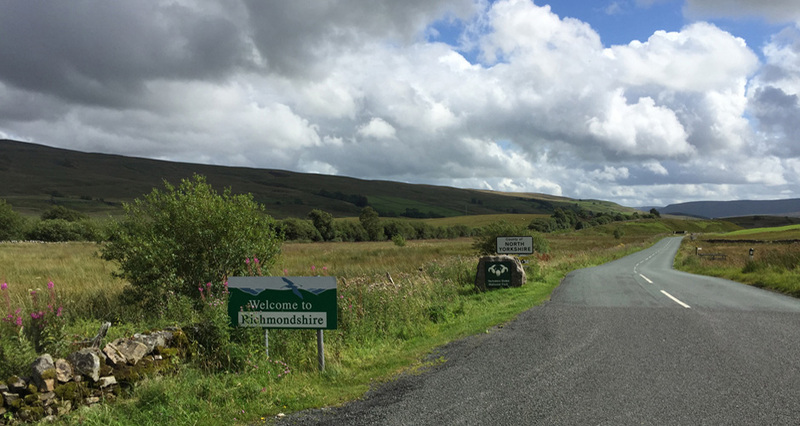 The route features a fair amount of climbing, in the original direction over the ‘Tommy Road’ down to Pendragon Castle, turning left into Nateby (optionally Kirkby Stephen) and then up the long drag that is Ash Fell. Now Ash Fell when travelling North East to South West (from KS to Ravenstonedale) and measured from Stenkrith to the fell summit is 610 feet of ascent over 3.5 miles, so around 3.5% gradient and that’s a fair amount of puffing and panting after the previous 10 miles of significant undulation, but today the hill turned into it’s own mini Eiger as I tackled it from the opposite direction. The base of Ash Fell after just 1.5 miles downhill from home gives the legs, the lungs and the heart a triple workout, gaining 310 feet in just 0.7 of a mile, which is an average 8.4% and enough for this old timer to start wishing for a set of ropes, carabiners and a harness. I’m led to believe that Great Dunn Fell and Hardknott Pass have sections of 25% but I’ll leave those until I’ve mastered correct warm up sessions and consumed at least three Shredded Wheat. This evening I had the pleasure to join Darren Alff’s live YouTube webinar for about an hour and a half. Darren is the cycle touring professional and can be found at http://bicycletouringpro.com where you can find a treasure chest of articles, photos, videos tips and tricks all revolving around his fifteen years as a serial cycle tourist. His country list is too long even for him to recite and his numerous trips in the USA (starting with the West Coast and including no less than six rides across his homeland) are truly inspiring. I was also interested to discover some of his most listened to podcasts (including “This American Life” which is my personal favourite) though I might have turned away to check the evening meal and missed a subtlety as to whether he listens whist riding or only when he’s not in the saddle. For my teeny-weeny cycle outings I listen sometimes to music and other times just to the environment around me, With the weather closing in and the clocks soon to change (Spring forward, Fall back as the saying goes) I can see that it all soon be time to turn to the indoor turbo trainer, at which point I will have the iPad mounted straight ahead with the brilliance of something like Twit.tv to pass away the exercise time, otherwise compensating for not being outdoors. 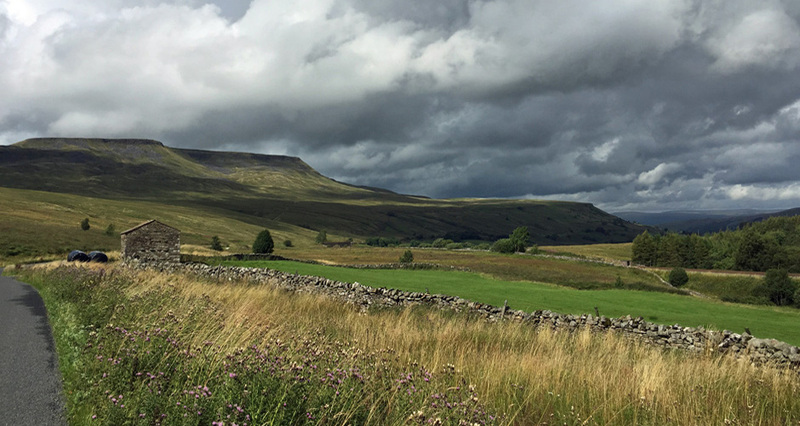 That said I am blessed with a beautiful view of Wild Boar Fell from the comfort of the garden room so with the combination of tech, warmth and a view, there’s really no excuse not to exercise is there?. So I succumbed to a GoPro Hero video camera for the bike adventures. More kit to carry and more time then up before and after the rides I know, but it all adds to the enjoyment. At least that’s what I thought at the time. My one and only trip out with it mounted on my cycling helmet was on a beautiful sunny day (last Sunday) and I found myself with an opportunity for a bit of a sporting ride. 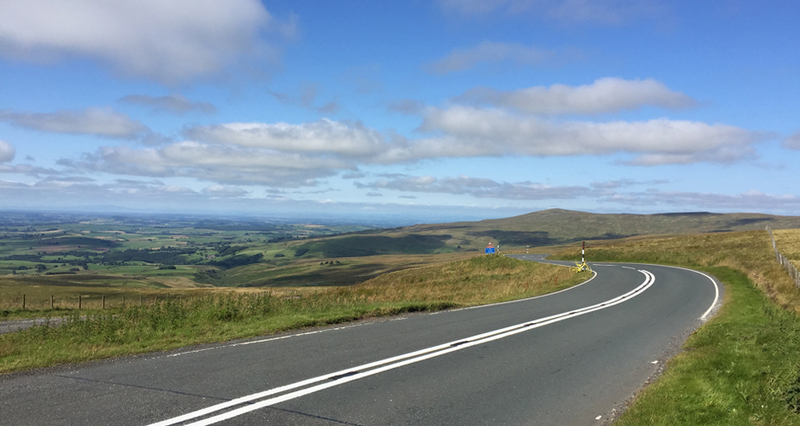 Four cyclists passed me as I paused at the Fat Lamb to make some adjustments and I took that as my cue to spice up the ride to Sedbergh with a bit of a race. The miniature peloton soon split as two of the guys pushed on swiftly, leaving one male and one female rider further separated. I used this little scene to add some commentary at different volume levels such that I could work out after the event how to get the best real time audio (anyone passing me might have thought I’d lost my marbles but they’d have had to be quicker than Cav or Brad at the speed I was going). I quickly tagged on to the back rider, spinning for a while as I took on some liquid. Then I made my mini attack and set my sights on the next rider. Meanwhile the front runners had paused to take pictures so I overtook them, by virtue of the fact that I was moving and they weren’t. Pretty good tactics thus far I think you’ll agree. I’d made a fair advance and decided I could afford a short stop at Cautley Spout for a sports gel. Just as I was getting on the bike the peloton had regrouped and came zipping past me (and was that a smirk I detected?). This little dance for positions was turning out to be fun. The group probably out for a nice leisurely ride were wondering what this joker with a camera on his head was up to but I wasn’t to be put off. I branched off into Sedbergh more or less alongside them so we’ll call it an honourable draw. The fact that I went up a one way street (deliberately) invited the wrath of an oldie in an open topped sports car. He shouted and gesticulated that I was going the wrong way. I thanked him politely and told him that I knew. On the return journey I had the camera running the whole time and captured scenes of the big event of the weekend, a wedding catered for by BigPanManCatering. Time to head home and see what footage was in the can. GroPro’s software would’t even install on Windows 10, nor in compatibility mode. I called the USA. Support was US. Their software installed on MacOS, started loading in data and then crashed, Eleven video sessions were imported but went down a black hole and the data card had been wiped in the process. The Camera was boxed up and shipped back and I bought another from a competitor (cheaper but with good reviews). I’ll need to spend more time experimenting properly, but I think it could be a useful addition to the tech bag. 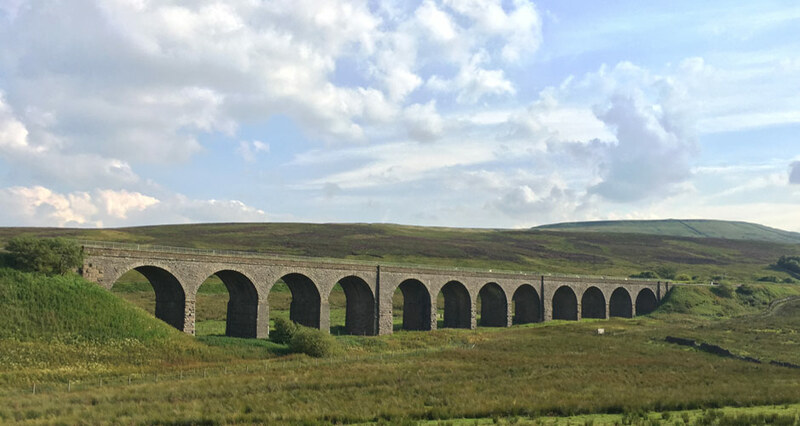 Having just finished the lovely circuit of Ravenstonedale – Outhgill – Garsdale Head – Sedbergh – Ravenstonedale with my good mate Kev Hillier, I see that I have now covered over 500 miles (about half the distance of Land’s End to John O’Groats). Now admittedly that has to be done in about six days when the real trip is underway but as the title of the first post to this blog indicates, things need to be nurtured well and given time to flourish. Kev will be my riding companion on the ‘End to End’ trip, so we’ll be our very own two man peloton. He craftily practiced the art of drafting / slipstreaming for a good part of the way tonight before an attacking finish from The Fat Lamb to his house (these young whippersnappers with nearly twenty years advantage eh!). I see the training stats also show that I’ve climbed nearly one and a half times the height of Everest and well above the cruising level of most passenger jets at over forty thousand feet. That’s Cumbria for you. Flat as a pancake for at least 100 metres at a time. It looks like I’ll hit the 100 miles for the week for the third time but I don’t expect to keep that up when the weather turns. Effort I can manage but cold, wet and windy I’ll draw the line at. Kev Cavendish on I died for 12 minutes! It’s official.